From the opening scene featuring dancing and flying ghosts, you know this version of “A Christmas Carol” is going to be different from the usual Christmas fare. The 20th Anniversary production of Charles Dickens’ classic story, directed by Rachel Alderman marks the holiday season in a spirited way (pardon the pun) and has embraced the Dickens classic story with a multi-racial cast. 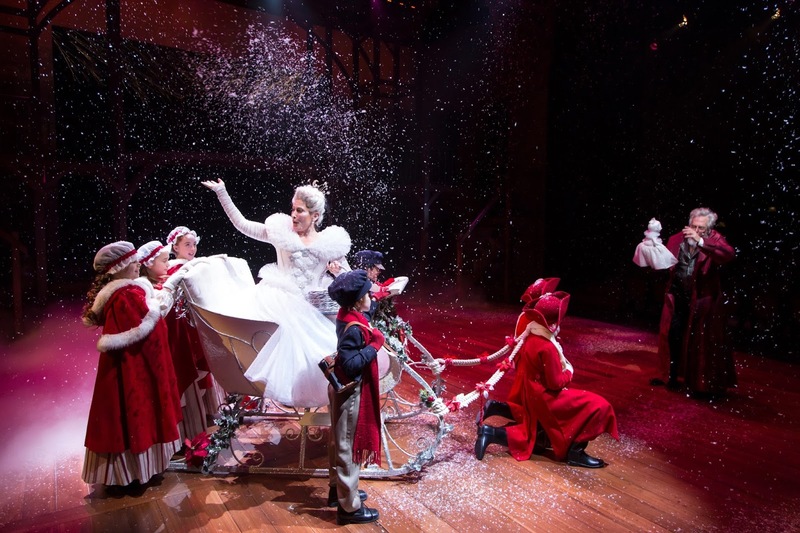 Originally adapted by former Artistic Director Michael Wilson, this production is a masterpiece of family fun that Dickens himself would appreciate. This year, Scrooge is delightfully played by Michael Preston, a former member of the Flying Karamazov Brothers, who adds his skills as a juggler and comic. The venerable Noble Shropshire in a dual role as Mrs. Dilber, and Jacob Marley’s ghost, provides a brilliant catalyst for Scrooge’s epiphanies. Twelve professionals in multiple roles and fstudents from the Hartt School (many of whom have professional status) share the stage with 26 adorable children from the youth ensemble in a beautifully choreographed story that brings the best of theatrical design to the experience. Special kudos go to choreographer Hope Clarke, scenic designer Tony Straiges, costume designer Alejo Vietti, lighting designer Robert Wierzel, and sound designer John Gromada for exceptional contributions to the storytelling. Hartford Stage has also designated special performances for audiences with special needs. December 17 will feature a 2 p.m. matinee for patrons who are deaf or have hearing loss, and there will be an open captioned performance on the same day at 2 p.m. and 7:30p.m. for patrons who are blind or have low vision. If you know a youngster who has never seen a live performance before, this production is a wonderful way to introduce them to the magic of the theatre. It was obvious that many of the audience members have made this an annual family event and cooed over the production pictures from past years, with even the youngest of children remembering characters from previous productions. Without a doubt, this show helps you understand the “spirit” of Christmas.